Austin-Bergstrom International Airport Parking Your car can pay for your parking space. Austin-Bergstrom International Airport Parking : Busy cities like Austin attract many people both local and foreigners. Austin is ranked the 31st biggest metropolitan area in the U.S.A. The city is even more industrious with the presence of the Austin-Bergstrom International Airport (AUS). The airport facilitates a significant influx of travelers to the Austin city. The city of Austin is famous for its high livability score. Residents are keen on conserving the environment through recycling materials, reducing water and electricity consumption through the use of alternative fuels. To curb the parking stress that comes with high passenger traffic, TravelCar has the most mouthwatering parking deals in the region. Our parking arrangements allow for both long-term parking and short-term parking. Extra facilities include a car wash, car vacuuming, change of oil and tires, and car detailing at the parking lots. We are based in all towns near the airport. Additionally, we offer car rentals in train stations, downtowns, hotels and airports near Austin-Bergstrom International Airport. To get all these, you only have to subscribe to our services on our website at www.travel.com and give us a call on +1 888-807-0209 in case you have any inquiry. Austin-Bergstrom International Airport is eight kilometers South-East of Austin Downtown in Texas. The airport is classified in Class C of international airports in the United States of America. The airport serves the Greater Austin Metropolitan Area and is commonly referred to as ABIA. Austin-Bergstrom International Airport is a public airport in the City of Austin. The City of Austin owns the airport. The City of Austin Aviation Department manages the airport’s operations. 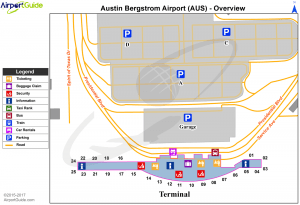 Austin-Bergstrom International Airport was constructed and opened on the 23rd of May 1999. AUS covers 4,242 acres of land on the area previously occupied by Bergstrom Air Force Base. There are three helipads, two runways, two terminals and 25 gates in its primary terminal. The Barbara Jordan Memorial Statue graces the airport grounds in honor of Barbara Jordan, a senior female politician in the Texas Region. AUS facilitates flights to other states in the United States of America, Europe, Mexico, the Caribbean and Canada. Austin-Bergstrom International Airport is currently the 5th most active airport in the State of Texas and the 35th busiest airport in the USA. AUS is a primary hub for Via Air and a focus city of Frontier Airlines and Southwest Airlines. In as much as there are numerous parking spaces at the airport, nothing can beat the mouthwatering parking deals at TravelCar parking lots. Moreover, it is much cheaper for you to park your car for extended periods at TravelCar parking lots than the conventional on-airport parking lots. Long-term parking Parking for the disabled is adjacent to the main terminal and shuttle stops. TravelCar has you covered with mouthwatering parking deals at Austin-Bergstrom International Airport. Our parking slots are conveniently located near the Barbara Jordan Terminal for ease of access. Our slots are covered to protect your vehicle. You can park for short or long periods depending on your schedule. At the parking area, we also offer car wash services, interior and exterior car detailing, interior vacuuming, car buffing, tire change and oil changing. TravelCar holds the security of your automobile in high regard. We secure the area with gates plus have guards to check the premises 24 hours a day. There is video surveillance of the premises supported by high-end CCTV cameras. Long-term parking at TravelCar slots is super cheap and secure. You may be interested in our ride-sharing service by getting your vehicle listed under TravelCar. Other travelers will get to use your car and pay for every mileage covered. Eventually, you stand to gain in more ways than one. TravelCar has an extensive network of personnel and automobiles to facilitate transport. Therefore, you are likely to find us at major airports in the U.S.A, big train stations in Texas, cities and business districts near Austin. We also provide car rentals for transport from nearby hotels. Wherever you are, we got your back. Check out the following areas that we are located. In case of any query, feel free to give us a call on +1 888-807-0209. Sun Marine Terminals, Port of Victoria, Point Comfort, Port Freeport, Port of Texas City, and Jacinto Port. Others ports include the Ports of Beaumont, Orange, Port Isabel, Sabine Pass, Palacios, Port Arthur, Corpus Christi, Bay City, and Matagorda Harbor. You can also find us at the Ports of Galveston, Brownsville, Neches, Houston, and the Port of Pasadena. We aim to make your travel experience fun, stress-free and cost-effective with our mouthwatering parking deals, impeccable valet service and top-notch customer support. We strive to make your journey via Austin-Bergstrom International Airport worth the while. Trustpilot vouched for TravelCar as being one of the top-rated service providers in the transport sector, in the United States of America. A good fraction of travelers prefer valet parking to self-parking of vehicles. This is attributed to some reasons from class, time-saving to energy saving. Whatever your reason for choosing our valet service, know that we have a flexible and supportive valet team. They are all professionals and handle numerous car models. It is hectic to travel from one state to another or to take international flights. You need a proper ground transportation plan to and from the airport that will save your energy and still be friendly to your tight budget. Aside from the mouthwatering parking deals that we offer, we have a very friendly customer service system. Tailormade to ensure all your parking and car rental needs are addressed, you can rest easy that you will have a smooth journey. Our customer support channels are open 24 hours a day, all days of the week, throughout the year. Access our Facebook page via the link https://www.facebook.com/TravelerCar/. Our Twitter handle is @Travelcar_ and website is www.travelcar.com. You may also check out our LinkedIn and Google+ profiles via the links https://www.linkedin.com/company/travelcar/ and https://plus.google.com/+Travelercar respectively. Our office phone number is +1 888-807-0209. Call us at any time, and one of our agents will assist you to get the services you need. There is public transportation means to the airport from Downtown Austin and the Northern part of Austin. The Capital Metro Transit authority provides buses that ply on Route 100 and Route 350 to ferry passengers to the Austin-Bergstrom International Airport. Super Shuttle is authorized to handle on-airport shuttle services. Road Capital Metro Transit Airport Flyer Using Route 100, the Flyer Bus connects the airport with Downtown Austin and the main campus of the University of Texas. Route 350 connects the airport with the Northern part of Austin. The bus plying this route reaches Austin Community College-Riverside, Northcross Mall, Highland Mall and Greyhound Bus Station. On Route 100, the bus departs every 30 minutes from 5:30 am to 11:30 pm on weekdays. The bus runs from 6:00 am to 11:00 pm on Saturdays. Capital Metro Flyer Bus works from 8:00 am to 11:00 pm on Sundays. The bus leaves after every 30 minutes. Route 350 bus is available on weekdays between 5:27 am and 10:50 pm. The Saturday bus schedule is from 6:43 am to 10:42 pm. On Sundays, the bus runs from 6:26 am to 9:06 pm. Access the airport terminals by using these roads: Interstate-35, 183, SH-71, Burleson Road, Emma Browning Avenue, Spirit of Austin Lane, and the Spirit of Texas Drive.